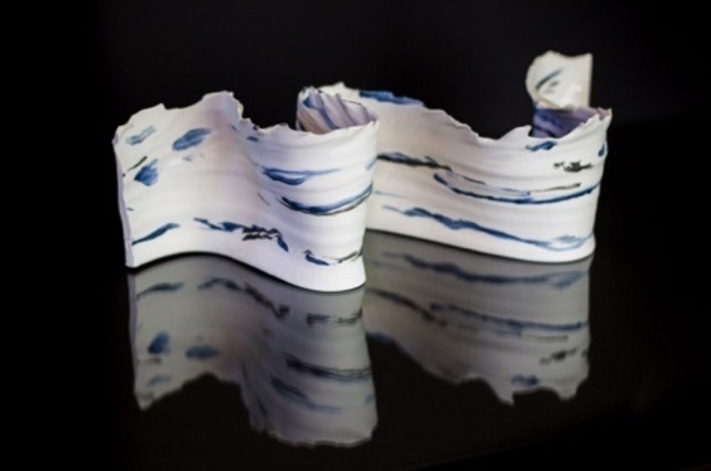 Karen is a ceramic artist who works with porcelain, thrown and then altered to create flowing abstract sculptures. Her inspiration comes from the coast and the constantly moving lines of colour in the water – they can be calm or full of energy and drama. She aims to reinterpret the flow and rhythm of the water and the constantly changing colours. She reshapes the clay while it is still damp to capture and retain a sense of energy and vitality. Although it can be challenging, Karen chooses to work with porcelain. Its whiteness provides a foil to the colours she uses and the extreme hardness of the fired porcelain is in contrast to the seeming nothingness of water and also an acknowledgement of its immeasurable force. Karen graduated from the University for the Creative Arts in June 2014 with a BA (Hons) in Ceramics. She is a Licentiate Member of the Society for Designer Craftsmen and a member of West Forest Potters in Berkshire. Karen is currently the Ceramics Artist in Residence at South Hill Park Arts Centre, Bracknell where, in addition to developing her own work, she teaches adult classes as well as a range of workshops.